Marking the perilous Florida Straits and the submerged reefs of the Florida Keys was one of the major projects of the Light House Board during the second half of the 19th century. After completion of the Carysfort Reef Lighthouse in 1852 amd rebuilding the destroyed Sand Key Lighthouse in 1853 and the next step was to build a new lighthouse to mark the dark area between these two sentinels. The man who had completed the two lights, George Meade who would later lead Union troops at Gettysburg, suggested erecting a light in the vicinity of Vaca Key. 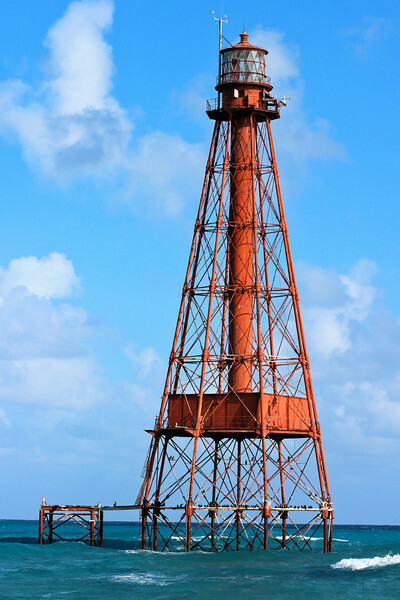 This led to the construction of the Sombrero Key Lighthouse seven miles offshore of the City of Marathon. When Captain George Meade wrote to the Light House Board in 1854 to propose a lighthouse, he planned for a masonry tower similar to several Scottish sea swept lighthouses. However, the estimated high cost of $300,000 to $400,000 persuaded the Board to consider building a skeleton tower like those at Sand Key Lighthouse and Carysfort Reef Lighthouse.